Kasaragod, the Northern most district of Kerala is renowned as the land of gods, forts, rivers, hills and beautiful beaches. The imposing fort at Bekal is one of the largest and best preserved forts in Kerala.The unique Bekal Fort stands amidst the roaming but heartening music of the seas along with the eternal note of the unending waves, carrying the thrilling memories of a bygone era Shaped like a giant keyhole, the historic Bekal fort offers a superb view of the Arabian Sea from its tall observation towers, where a few centuries ago huge cannons used to be placed. Nearby is an old mosque said to have been built by the valiant Tipu Sultan of Mysore. Built by the rulers of the ancient Kadampa dynasty, the fort changed hands over the years to the Kolathiri Rajas, the Vijayanagar empire, Tipu Sultan and finally, the British East India Company. Today, the Bekal fort and its surroundings are fast becoming an international tourist destination and a favourite shooting locale for film makers. Bekal is also one of the five centres selected by the Government of India to be developed into a 'Special Tourism Area'.The Hanuman temple and the ancient Muslime Mosque nearly hold testimony to the age-old religious harmony that prevailed in the area. The zigzag entrance and the trenches around the fort show the defense strategy connected with the fort. The nearest airport is at Mangalore, 50 km away. Kochi airport is 420 kms south. Kasargod has a railway station, which is linked to several important towns. Motorable roads connect Kasargod to towns in Kerala and neighbouring Karnataka. Muzhappilangad:Muzhappilangad Beach which spreads about 4km is said to be the only Drive-in beach in Kerala.Muzhappilangad beach is situated about 5 km north of Thalassery and 15 km from Kannur.To the South and about 200 metres away from the beach there is a beautiful island called the "Green Island" which adds to the allure of the beach.The shores of the Muzhappilangad beach are lined with black boulders, which protects the shores from the lashing waves and also make a natural shallow place. One can easily swim in this natural shallow pool of water without having to fear the powerful currents. One can soak up the sun while lying lazily on the rocks. It is a beach lover's paradise. Parassinikadavu Muthappan Temple :Parassinikadavu Muthappan Temple is located on the banks of the Valapatnam River and attracts people from all parts and sections of the society. Irrespective of religion and caste, thousands of devotees throng the place. This temple truly signifies the essence of "Vasudaiva Kutumbakam- the whole world is one family." Famed for the Muthappan Temple, where Muthappan Theyyams are performed every morning and evening.The Parassinikadavu Muthappan temple is also a popular destination for travelers and pilgrims to savor the charm of Theyyam, a ritual that is performed here on a daily basis. Men adorning masks and colorful costumes perform this temple art form, which represents conflict between good and evil, with good ultimately emerging victorious over evil. Coorg (120 km from Bekal): Hill station famous for rolling hills, forests, coffee plantations. 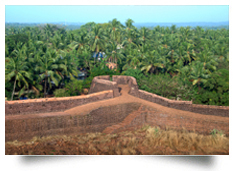 St. Angelo Fort: St Angelo Fort is also known as Kannur Fort or Kannur Kota. This 16th century fort faces the Arabian Sea. 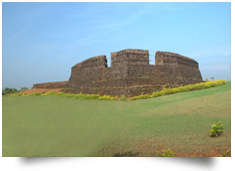 The fort like many Forts in the Kasargod region had a chequered history with the control changing hands several times. It was actually that whoever controlled the fort controlled the trade of this region. Such was the importance of the fort. St. Angelo`s Fort was originally built in 1505 AD on the orders of Sir Francisco De Almeida, the first Portuguese Viceroy of India. In 1663 the Fort was captured by the Dutches after fighting the Portuguese, who then subsequently sold it to the Arakkal Royal Family in 1772 AD. In 1790 AD the fort came under British control. They transformed it into a formidable military station on the Malabar Coast. During the 19th century, St Angelo Fort became part of the Cannanore Cantonment established by the British. 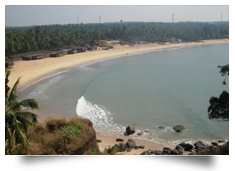 Pallikere Beach: This beautiful expanse of shallow waters and beach offers a spectacular view of the Bekal Fort. The public beach has ample space for recreation and relaxation. With international standard facilities to be developed here, Pallikere will rank among the best beaches in the country.Pallikere Beach offers an enthralling fort view as well as various relaxation and recreation facilities. The beautiful beach is surrounded by dense bushes and coconut tress, thus making this place a classy tourist attraction. Pallikere Beach is one of the most frequently visited picnic spots by the tourists.